The ten sculptures in the Passages series were executed at the Emma Lake Artists’ Workshop in 1985 under the tutelage of workshop leader Tim Scott, a highly respected abstract sculptor from London, UK. This group of ground-oriented works was assembled from random chunks of preformed metal, salvaged from derailed railway tank cars. When Bentham visited the John East Ironworks he was perhaps predisposed to a discovery of materials that promised new formal possibilities for his art. There, he found piles of discarded foundry equipment: long-handled ‘shovels’ for skimming the dross, ladles for the molten metal, pouring spouts, sprues, vents and all the pieces broken from the product after casting. In these unlikely objects he sensed a new direction for his art—with time, the steel tools used to manipulate the molten iron had undergone fantastic change. As the cups of the ladles, the heads of the shovels and portions of the handles were repeatedly dipped into the molten metal, they were coated with iron, which steadily accumulated in successive layers about the underlying form.…Bentham recognised in these objects the formal means for linear sculptural composition, drawing in space. These were of a more-or-less consistent thickness, and had richly textured masses of various shapes. 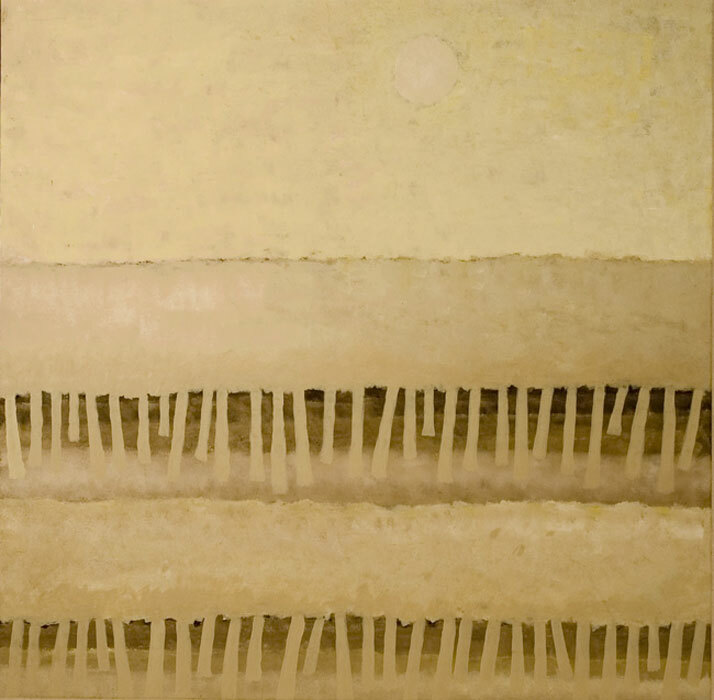 At the same time, he responded to their expressive character, to the suggestions of gesture in their linear configurations, and to the delicacy and fragility of their surfaces. They were, as well, evocative of time and the processes behind their eventual form. His new work pushes abstract sculpture towards the Baroque. Nevertheless, the pieces are organized—governed, by their own sculptural architecture. This architecture inclines to cage-like configurations characterized by curved rods and tubes containing curved plates and volumes. 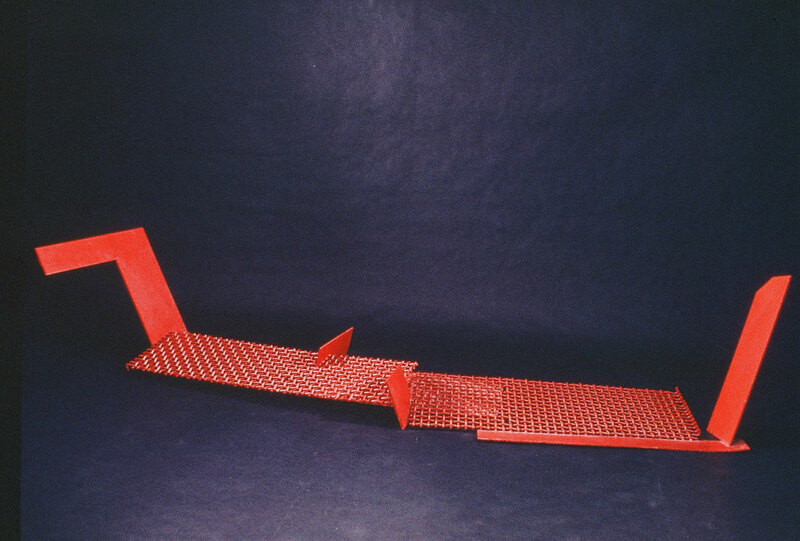 The pieces rise off the ground in a variety of ways, sometimes upon platforms that become surrogates for the floor rather than bases or plinths. These platforms don’t hold the sculpture aloft in the traditional sense. They’re part of the visual universe of each work rather than a separate element. They’re something like abstract “stages” which help to separate and isolate the configurations. The platforms keep them apart; they insist that the sculpture is designed to be looked at rather than physically entered. The curved “drawing” which composes them has two aspects: it draws sinuous “dancing” arabesques in the air and it draws around and contains space. In the first aspect it draws within and penetrates space. In the second, it draws “around” space, creating transparent shaped and volumes. These two aspects of linear drawing are augmented by the insertion of plates, cones and cylinders. Here Bentham gains variety by playing off transparent shapes (drawn with rods and thin pipes) against these opaque solids. These rather musical compositions play upon the relations between the explicit and the implicit, in effect blurring the distinctions between the two. Solids become illusory. Spaces become substantial. The various parts set up echoes and rhythms within the piece, much like echoes and rhythms do in music or poetry. While many sculptors, especially those working in steel, seem to be obsessed with mass and inherent characteristics of material, Bentham is concentrating on transcending such physical limitations. In these pieces he has dropped any associations with found objects, and he has rejected the concept of the ‘culture of materials’. Simultaneously, the final image owes as much to the experience of manipulating material, to adding and editing, as it does to conception, resulting in a tense equilibrium between Bentham’s will and steel’s properties. The salient point is that, unlike many artists working with a particular material, be it steel or videotape, Bentham is in control. He is not being manipulated by his material. It is this liberation which allows his work to overcome the particular in favor of the universal. The Opens are deceptively sparse, almost to the point of being minimal. Heavy channel iron, looking very much like a frame, defines a specific section of space. Through this basic easel-like construction, a triangle base is inferred, automatically establishing a traditional three-dimensions. The framework and its attached elements sets up a surface and at the same time directs us back into the enclosed space. Whereas, traditionally, not being able to look at a freestanding work from all sides was a problem, these sculptures seem to require that problematical factor for their success. The knowledge that we could walk around them if we wanted to seems to be sufficient. When you were saying that you want people to examine your pieces closely, perhaps psychologically, the enclosed space makes—that is, it draws—a person to the piece rather than asking him to stand away and look at it from a distance. I find these Enclosures seem to hold a secret. They draw you to themselves like any box does. You want to see inside. 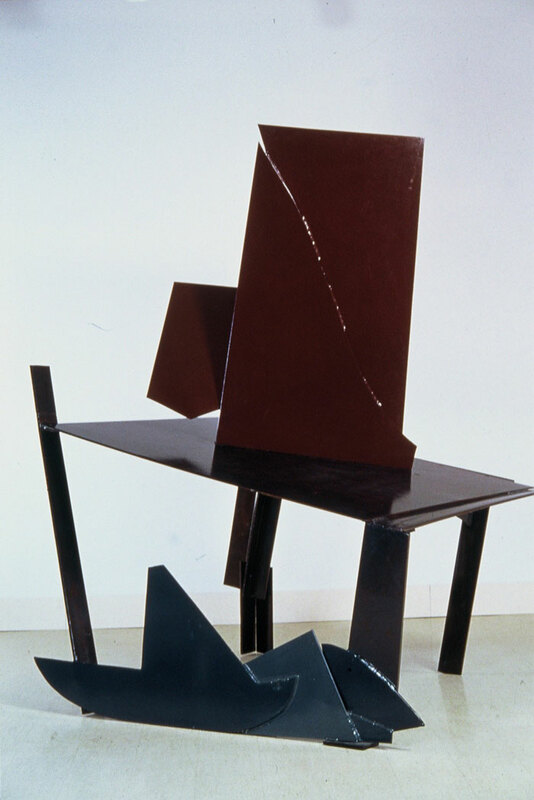 The idea of sculpture as drawing in space has been central to the development of modernist sculpture from the first decades of the twenty-first century. Julio Gonzalez first articulated it in 1932, describing the “new art: to draw in space”. 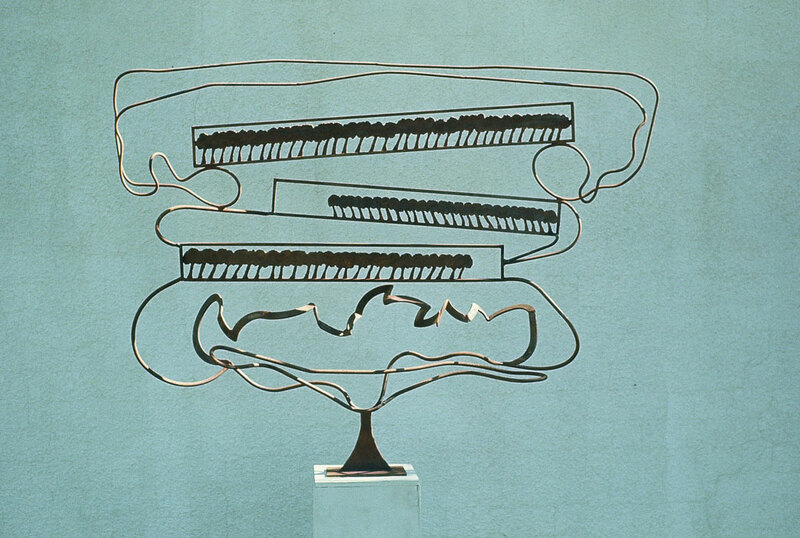 Gonzalez was referring retrospectively to Picasso’s early sculpture and, by implication, to the welded metal sculpture on which he and Picasso had recently collaborated. The phrase makes reference to the pictorial origins of the new sculpture in cubism, and vividly conveys the character of the open, linear constructions originated by the two artists in 1928. Building on the work of Gonzalez, [David] Smith accomplished his own radical and distinctive formulation of the idea. At the outset of his career as a sculptor, Bentham too was occupied with drawing in space. 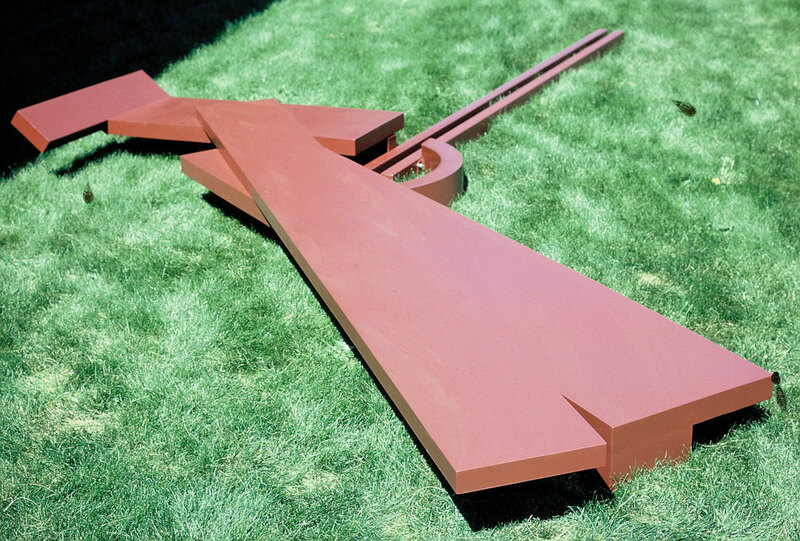 He was aware of Smith’s insistence on the primacy of a picture plane as the basis for sculpture. The two-dimensionality and dependence on line for the spatial image, which characterize Bentham’s earliest independent works explore Smith’s idiom. 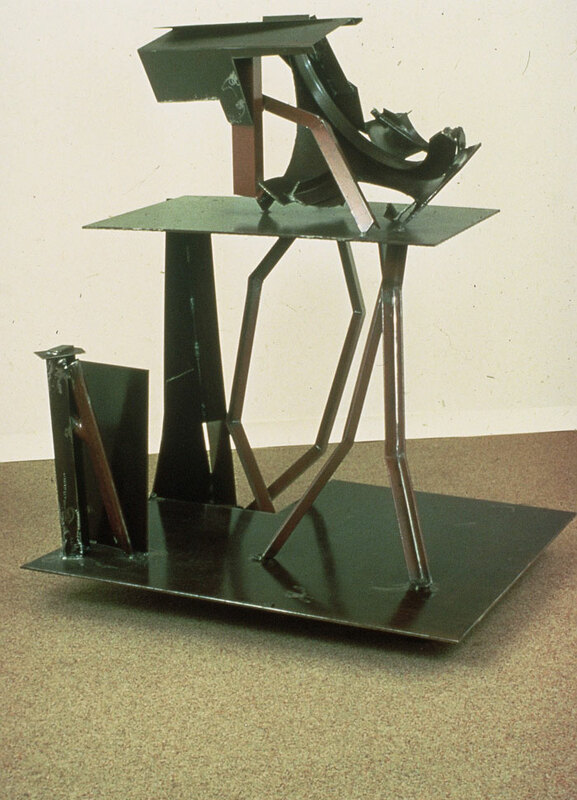 The Hardingham series is comprised of six monumental steel sculptures executed in 1990 at the Hardingham Sculpture Workshop at Norfolk, U.K. 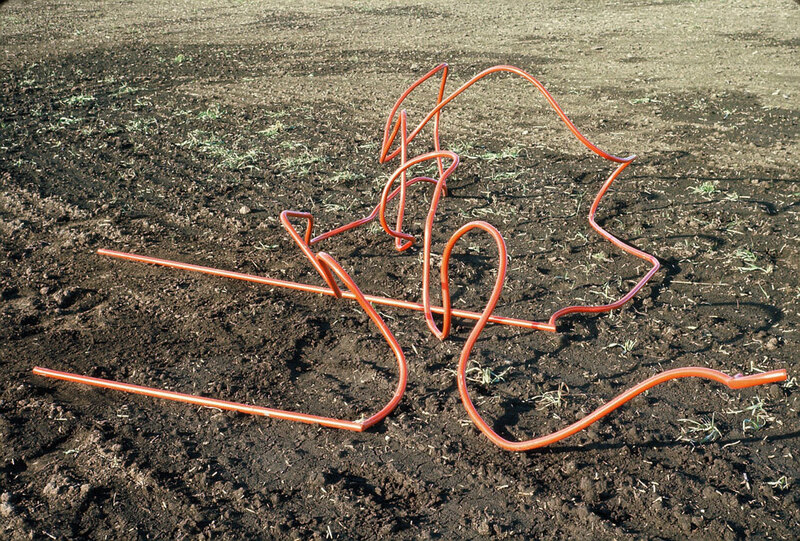 These sculptures were Bentham’s direct response to the stimulus provided by fourteen days confronted with British steel, hot days tempered by cooling rains, other sculptors’ provocations and his own competitive spirit. Hardingham Memory was created some time after his return to his prairie studio, and is dedicated to his friend and fellow sculptor, John Foster. Seventeen years later, in Crossing the Pond, an exhibition shown at APT Gallery in London, UK, Bentham complemented the Hardingham sculptures with six new stainless steel sculptures from his then current Espalier series. Bentham thinks of his working method as drawing with metal; edges and their relationships make tense linear rhythms in his work.